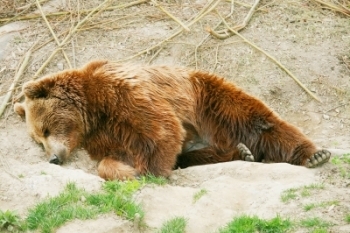 Do you feel like this bear in the picture during the fall and winter months? Well, there were evolutionary benefits to this behavior in the past; even for humans believe it or not, but times have changed. Seasonal Affective Disorder, otherwise known as SAD, is typically a depression that occurs around the fall and winter. A lot of people report that they have the "winter blues" during the colder months, but SAD is more than just the blues. SAD can be a serious condition and should not be taken lightly. Individuals who suffer from SAD often report feeling hopeless, anxious, sad, have low energy and motivation, and report feeling "sluggish." They may withdraw, have less interest in sexual intimacy, sleep and eat more than usual, gain weight, and have difficulty concentrating. Also, a loss of interest in things once enjoyed may also be experienced. When serious, some may even report suicidal ideation. Simply, SAD is a Major Depressive Disorder that is Recurrent with a Seasonal Pattern. I often get asked the question about what causes SAD. First, what's important to know about this process is that once the nights become longer, it throws off one's internal biological clock. Meaning, that the body wants to go to sleep earlier and sleep longer. This physiological process has some to do with melatonin, which is produced in greater quantity during fall and winter, and perhaps, responsible for some the sluggishness that individuals report. Also, during fall and winter, we know that serotonin, a naturally occurring neurotransmitter in the body lowers, affecting one's mood. Sometimes to increase serotonin levels in the body, people eat more carbohydrates like cakes, cookies, ice cream, and pizza and pasta. Why? Because this indirectly increases one's serotonin-the more serotonin we have available the better we feel. Some people are at greater risk of developing SAD than others. Generally, we tend to see SAD more often in women than men; however, the symptoms for men tend to be more intense. People who live further from the equator where the nights are longer can also trigger symptoms of SAD. We also know that SAD can run in families, and thus, one may have a predisposition to develop SAD. Someone who has a history of depression might also be more likely to develop SAD. Since there aren't any particular medical tests that can be performed to diagnose SAD, it's very important to know your risk factors. Since the symptoms of SAD can be similar to the symptoms of other medical conditions, your doctor is likely to perform tests (e.g. blood work) to rule out other medical conditions. The first line of treatment for moderate levels of SAD is light therapy also known as phototherapy. If you have milder symptoms of SAD, just getting outside or having more access to daytime light can prove to be helpful. For some, this isn't enough. SAD then is treated with light therapy using what is a called a "light box." Basically, it's a box with bright white fluorescent bulbs. Any yes, the ultraviolet radiation is filtered out. The typical intensity of this light is 10,000 lux with an average daily exposure of 30 minutes, which is ideally administered in the morning. The purpose of light therapy is to re-set one's biological clock. Of course, although light therapy is one of the first lines of treatment for SAD, there are additional treatments that can also be effective. These include: psychotherapy, taking antidepressant medications, exercising, eating healthier, taking supplements, and/or participating in mind-body practices such as yoga, acupuncture, meditation, and massage therapy. It's important to know that SAD sufferers do not have to suffer during the winter months; help is available. If this describes you, reach out to your medical doctor or healthcare provider to determine if what you are experiencing is SAD. And before you take measures to treat your symptoms, it's important to speak with your doctor regarding your treatment interests to make sure you're receiving the most effective treatment for the severity of your symptoms. If you would like to learn more about Seasonal Affective Disorder, attend my workshop with CIRC Training-Central Indiana Regional Chapter on Friday, November 21, 2014. This workshop will provide an overview of the origin, history, signs and symptoms of SAD, as well as of the risk factors which exacerbate the symptoms and increase vulnerability to the disorder. Treatment options, with an emphasis on light-based therapy, will be covered in depth. Check out the following CIRC Training flyer for the details!